Posted December 2, 2014, in Faculty News, Featured News, News, We R Arts and Sciences Student Spotlight. As a young boy growing up in Italy, Benedetto Piccoli was fascinated by mathematics. As he got older, his interest in math never waned, and when he entered the University of Padua for his bachelor’s degree, his appreciation and passion for the subject strengthened as he began to learn about “modern math,” which is not linked to numbers but to theoretical ideas. He ultimately earned his Ph.D. in mathematics, and then become a permanent researcher for the International School for Advanced Studies (SISSA). 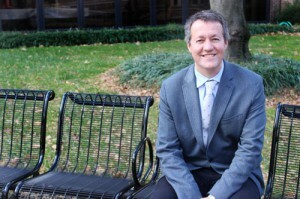 It was during this period that Dr. Piccoli had his first exposure to Rutgers University: from September 1995 – March 1996, he was visiting professor and researcher at the New Brunswick campus, an experience he calls “very positive” and helped influence his decision to ultimately return to Rutgers as the Camden campus’ first endowed chair. Joseph and Loretta Lopez (both CCAS ’64), who met while students at Rutgers–Camden, contributed a multimillion dollar gift to create the Joseph and Loretta Lopez Endowed Professorship in Mathematics in Honor of Professor Leonard Bidwell. At the time of the announcement of this new position, Dr. Piccoli was looking at opportunities in other countries, but was particularly interested in coming back to the United States. The endowed professorship, which is a prestigious honor that enhances a faculty member’s ability to do research, attracted his attention. Dr. Piccoli was selected for the position, and was formally installed as the first endowed chair in November 2009. He calls the career move “a life achievement,” and calls the encouragement and support he received when he arrived on campus “a great, positive surprise.” He and the Lopez family have become friendly over the years; Mr. and Mrs. Lopez traveled to Rome recently, and Dr. Piccoli served as their tour guide. The new Center of C omputational and Integrative Biology (CCIB) was also something that “extremely interested” Dr. Piccoli. The idea to bring math to other disciplines and real-world applications that impact people’s lives was a challenge he found exciting. “Scientists in different fields working together is so important, but rare,” Dr. Piccoli says. CCIB helps to bridge that gap. From October 2011 – October 2014, Dr. Piccoli has served as the graduate director of the computational and integrative biology program, performing administrative duties and helping to keep computational and integrative biology master’s and doctoral studies on track. One of Dr. Piccoli’s proudest and happiest moments at Rutgers–Camden is when Matthew Niepielko became the first computational and integrative biology doctorate student to earn his Ph.D. in May 2014. Matthew, who worked with both Dr. Piccoli and Dr. Nir Yakoby, Associate Professor of Biology and the new graduate director of the computational and integrative biology program, is currently a post-doctoral fellow in a molecular biology lab at Princeton University. Recently named the director of CCIB, Dr. Piccoli will now focus not just on the graduate computational and integrative biology program, but on the center as a whole. He wants to advance the center by organically developing its new undergraduate program, continue to mentor and nurture its current graduate student population, and grow its Research Experience for Undergraduates (REU) program, which is a National Science Foundation-founded summer program that provides research experience for up to ten undergraduate students. Dr. Piccoli’s first order of business has been to create an Executive Committee, which will act as a governing board for the center. The committee, whose members were nominated by the department chairs, is comprised of Dr. Eric Klein, Assistant Professor of Biology; Dr. Jinglin Fu, Assistant Professor of Chemistry; Dr. Desmond Lun, Associate Professor of Computer Science; Dr. Nawaf Bou-Rabee, Assistant Professor of Mathematical Science; and Dr. Grace Brannigan, Assistant Professor of Physics. Dr. Piccoli’s interest in CCIB’s interdisciplinary spirit plays a role in his own research, as well. He recently published the book Multiscale Modeling of Pedestrian Dynamics, which, like much of his research, centers on the science of movement. This particular project focused on human walking. Along with researchers from areas such as biology, psychology, and engineering, Dr. Piccoli examined how people walk when an obstacle, such as a cone, is placed before them. Dr. Piccoli proposed a model and algorithm, which led to him, Dr. Mary Bravo, Associate Professor of Psychology, and Emily Leibowitz (CCAS ’12) conducting three different experiments, which, interestingly, had three different results. The first three chapters of Multiscale Modeling are “formula-free” and written so that anyone, regardless of their academic background, can understand and enjoy. Another exciting project that Dr. Piccoli, along with Dr. William Saidel, Associate Professor of Biology, is mentoring is the “octocopter” project of Scott Davis (CCAS ’15), who is currently a student in the graduate biology program. The octocopter is a flying drone that is equipped with cameras that take pictures of flocks of birds, particularly starlings, which fly together in elaborate, seemingly random patterns, in perfect harmony, a process called “murmuration.” There is a lack of data on murmuration, so this is a great opportunity for Dr. Piccoli and his colleagues to contribute to the research on this phenomenon. Clearly dedicated to his research, Dr. Piccoli also savors his time in the classroom with his students. “I want to impart my passion on to my students,” he says. He does this through highly interactive classes, where the students are constantly engaged in the material. Dr. Piccoli’s enthusiasm and energy have been well-received by his students, because in 2013 he received the Chancellor’s Award for Teaching Excellence, an award Dr. Piccoli was grateful to receive, in part because his students volunteered to write letters on his behalf, supporting his nomination for the award. “It meant a lot to me,” he says simply. While Dr. Piccoli has only been at Rutgers–Camden for five years, it’s certain that he has made his mark on this campus, from being the first endowed chair, to receiving the Chancellor’s Award for Teaching Excellence, to now overseeing the Center for Computational and Integrative Biology. He’s an integral part of our campus, and we couldn’t be more delighted that he’s found a home away from home with us at Rutgers–Camden. Page last updated by Faculty of Arts and Sciences at 10:11 am August 10, 2017 . This page was printed from http://fas.camden.rutgers.edu/2014/12/02/we-r-arts-and-sciences-dr-benedetto-piccoli/ at 9:18 AM Friday, April 26, 2019.